There were five Philistine cities; these are listed as Ashdod, Gaza, Ashkelon, Gath, and Ekron (1 Sam. 6:17). Today’s post features an aerial shot of the Philistine city of Gath. 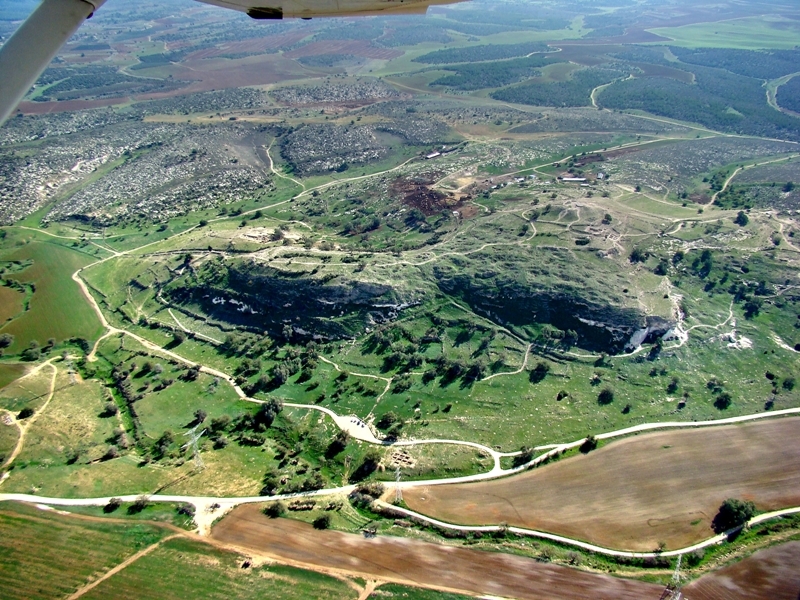 Aerial of Gath of the Philistines. Photo ©Leon Mauldin. There are numerous biblical references to Gath. Goliath the giant, the Philistine champion, was from Gath (1 Sam. 17:4). David fled from King Saul, seeking asylum from Achish, king of Gath (1 Sam. 21: 10), but when he saw he was is danger there too, pretended to be insane. However, David was later successful in finding refuge at Gath (1 Sam. 27:1ff), though subsequently the Philistines gave him his own city of Ziklag. When Saul and his son Jonathan (David’s best friend) died at Mt. Gilboa, David wrote a song that included the words, “Tell it not in Gath, Proclaim it not in the streets of Ashkelon — Lest the daughters of the Philistines rejoice, Lest the daughters of the uncircumcised triumph” (2 Sam. 1:20). “Later David defeated the Philistines and subdued them. He took Gath and its surrounding towns away from the Philistines” (1 Chron. 18:1, NET). Also, bear in mind that when you see the word Gittite that reference is made to a resident of Gath. One of David’s most loyal followers was Ittai the Gittite. When David was forced to flee Jerusalem during his son Absalom’s rebellion, he told Ittai that he was not expected to accompany David. “But Ittai replied to the king, ‘as surely as the LORD lives, and as my lord the king lives, wherever my lord the king may be, whether it means life or death, there will your servant be'” (2 Sam. 15:21, NIV). Remember to click on photo for higher resolution. I’m currently in a 4-day meeting in Lawrenceville, GA., presenting a series of lessons on “Becoming More Like Jesus.” My friend Allen Shepherd is the local evangelist. This is my second time to be with this congregation. The meeting concludes tomorrow evening. Also, my mother-in-law, Mrs. Ura May Creel, passed away this past Sat. after a long battle with Alzheimer’s. My brother-in-law and I conducted the funeral service yesterday in Hanceville AL. Three of her grandsons led congregational singing. I regarded her as a mother. We sorrow, but not as those who have no hope (1 Thes. 4:13ff.). This entry was posted on Tuesday, October 26th, 2010 at 10:28 PM and is filed under aerial photos, Bible History and Geography, Bible Study, Israel, Travel. You can follow any responses to this entry through the RSS 2.0 feed. You can leave a response, or trackback from your own site.